Low back pain (LBP) is one of the most prevalent health problems amongst population and is a leading cause of disability that affects work performances and well-being. Strong association between LBP and IVD degeneration has been repeatedly reported in various clinical studies. Although almost every medical imaging modality has been used to evaluate lumbar degenerative disc disease, Magnetic Resonance (MR) Imaging (MRI) is widely recognized as the imaging technique of choice for the assessment of lumbar IVD abnormalities due to its excellent soft tissue contrast and no ionizing radiation. 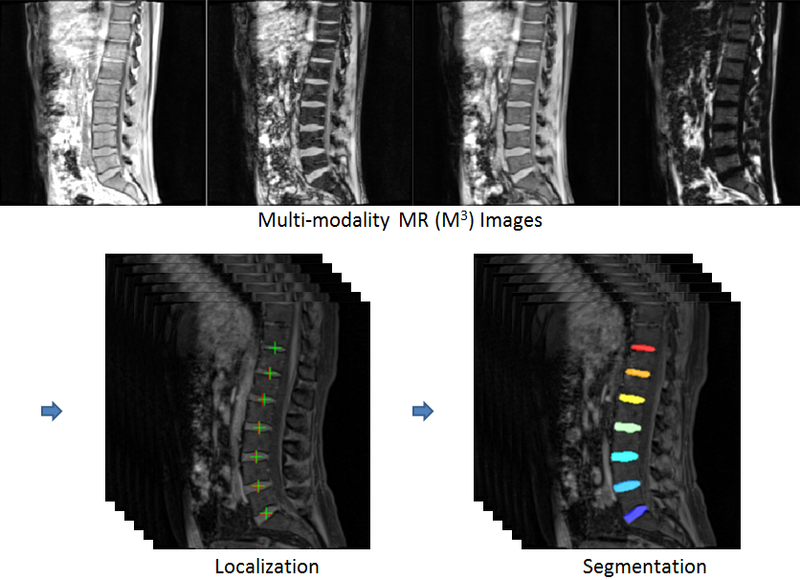 This, in turn, has sparked specific interest in developing methods for automated image analysis and quantification for the diagnosis of MR images of lumbar spine. The goal of MICCAI 2018 Challenge on Automatic IVD Localization and Segmentation from 3D Multi-modality MR (M3) Images is to investigate (semi-)automatic IVD localization and segmentation algorithms and provide a standard evaluation framework with a set of multi-modality MR images acquired with Dixon protocol. The challenge participating teams (two co-authors in each participating team) will be invited to contribute to a joint journal paper describing and summarizing the challenge outcome, which will be submitted to a high-impact journal in the field. This Challenge is in conjunction and with the support of the 2018 MICCAI Workshop & Challenge on Computational Methods and Clinical Applications for Spine Imaging .